Federico Bonacossa is a composer and classical guitarist based in Miami Florida. He studied classical guitar at the Conservatorio Statale G. P. da Palestrina in Italy before moving to the U.S. in 2001. He holds a master’s degree from the Peabody Conservatory, a doctorate from the University of Miami in classical guitar performance, and a master’s degree from Florida International University in composition and electronic music. His recent work as a composer explores various forms of interaction between live performers and the computer, the relationship between pitch and rhythm, and the transcription of spontaneous vocal gestures with the aid of the computer. 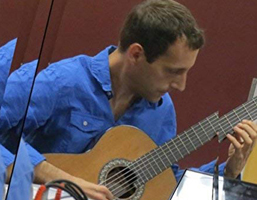 He is the company composer for Dance NOW Miami and is a member of the Miami Guitar Trio. As a performer he is involved in promoting new music for guitar, especially works that feature electronics. Recent experiences include performances at the Fillmore Blackbox Theater, Subtropics Festival, Mainly Mozart Festival, New Music Miami Festival, Compositum Musicae Novae, USF New Music Festival, Electronic Music Midwest Festival in Kansas City, Contemplum symposium in Philadelphia, Kendall Sound Arts, 12 Nights Electro-acoustic Series, the Miami World Music Festival, the Miami Dade College On Stage Series, the Miami International Guitar Festival, Guitar Sarasota, the Miami Bach Society, the State College of Florida, the Bass Museum of Art, the Scuola Civica di Musica in Olbia, Italy, the Sephardic Jewish Synagogue in Lima, Peru, and a live concert for WLRN. He is currently Instructor of Music Theory and Musicology at Florida International University.